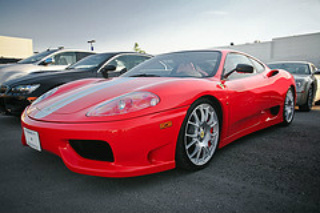 The Challenge Stradale sports car was introduced by Ferrari in 1999, alongside the launch of the 360 Modena and Spider. 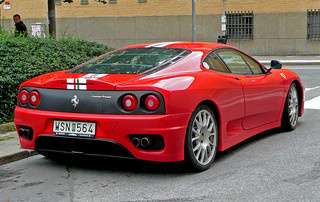 The Stradale was the highest performing, road-going variant in the 360 Series. It was the successor to the 355 Challenge sports car whose development reached a peak in 1998 with the Evolution variant, which was an almost complete factory assembled race car. 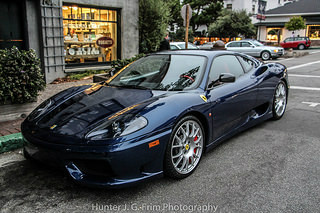 The 360 Challenge was based on the 360 Modena, and was a limited edition racer that was designed by Ferrari to spend 20% of its time as a track day racer, and the remaining 80 % as a road-going sports car. These changes produced a weight saving of 94 kg. The engine, body panels, and chassis were all constructed from aluminium. When using the standard six speed F1-style paddle shift gear change system, the driver could throw a switch and select either Sport or Race-mode. In the case of the latter, when the traction control was switched off, there was a feature that allowed the driver to engage a high performance start, so long as the prevailing driving conditions allowed the car to develop sufficient grip. The chassis of the Stradale had been designed so that the centre of gravity was 15 mm lower than the standard car. All non-essential interior fitments, such as carpeting and mats had been removed, and the door panels were constructed from carbon fibre. It used lightweight aluminium roll-over bars behind the seats that were designed specifically for the car, and was fitted with stiffer springs and adjustable computer controlled damping. With a modified carbon fibre under-tray, down force was further increased the harder the car was driven. The 360 Challenge was powered by the same mid-engined, 3.6 litre, V8 unit, with five valves per cylinder, as the other 360 variants, and developed 425 bhp at 8500 rpm, and 275 ft/lbs of torque at 4750 rpm. This produced a top speed of 186 mph, and a 0-62 mph time of 4.0 secs. Output was increased by using high compression combustion chambers with polished ports, and raising the compression slightly to 11.2:1. The total weight of the engine and gearbox was reduced by 11 kg by using a shorter, lightweight, stainless steel sports rear exhaust box, and modified outlet pipes. With an original price of $195,000, on the second hand market, a Ferrari 360 Challenge Stradale that was in good condition would fetch around $160,000, whilst an example in showroom condition would command in the region of $320,000. 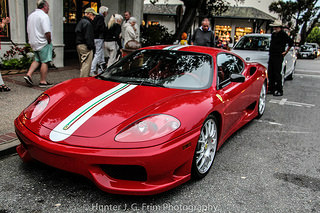 Another one of these classic cars from Ferrari.